A native Las Vegan, Pamela, along with her sister, Christina, launched Velveteen Rabbit on Main Street in 2013. Word spread quickly among locals of the magical space situated in the heart of the Las Vegas Arts District, where the community could gather for conversation while enjoying cocktails that boast fresh ingredients, a range of specialty beers, the work of downtown artists and the music of local musicians. And now, after more than four years of commuting to work from various valley neighborhoods, Dylag is both a proud Arts District business owner and resident. In July, she purchased a one-bedroom residence at Juhl. “I can leave my home and be mixing drinks behind the bar in five minutes. That’s both impressive and extraordinarily convenient,” she said. That welcoming feeling is exactly what Dylag was searching for when she decided to call Juhl home. A lifelong dancer, Dylag gets a good feeling about her new home and her hometown, when the view through her floor-to-ceiling windows frames The Smith Center for the Performing Arts. She even finds a sense of creativity and community in overlooking City Hall. A thirty-something, avid globe-trotter, Dylag recently returned from a visit to Tasmania, where she was awed by the exhibits at the MONA (Museum of Old and New Art) in addition to partying at the local art and music festivals. Anticipating many more adventures in her future, Dylag wanted a home that gave her the flexibility to pack a bag, close the front door and leave town without worrying about security or maintenance. “For that reason, Juhl topped the list,” she said. 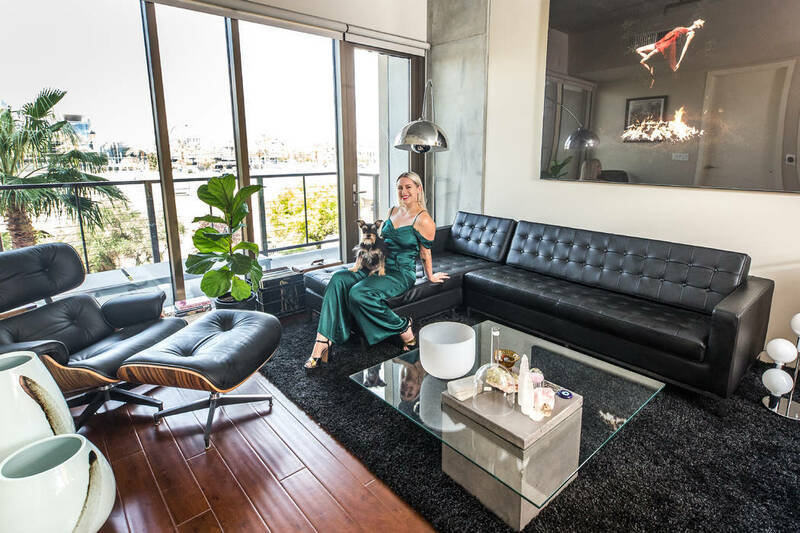 Juhl, which spans an entire city block in downtown Las Vegas, is an urban destination and a popular residential choice for professionals and entrepreneurs, especially many who work at firms and courthouses throughout downtown’s expansive legal community. Juhl encompasses multiple buildings, including a high-rise, mid-rise, brownstones, live/work spaces, retail spaces and a warehouse-style loft building. A summer kitchen, called “Canvas Grill,” is the perfect spot for warm-weather entertaining. And a nearby Urban Garden plot exclusively for use by Juhl residents makes it possible to grow fresh herbs and vegetables in the heart of the city.